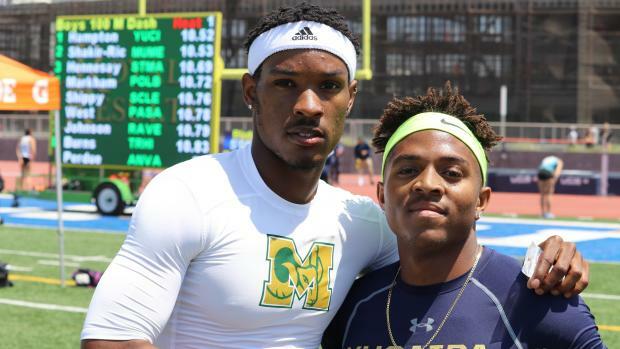 Let's take one last look back at the top boys combination sprinters in CA during the 2018 T&F season. The database report is designed to rank athletes by the first category listed, in this case the 100m, and to weed out anyone without marks from the spring season in both the 100m and 200m. What that means is that State Meet 100m champion Kazmier Allen is not listed. Allen only competed in the short sprint. Asani Hampton, the State Meet runner-up in both sprints, ranks #1 here because of his 10.26 (wind-legal) 100m clocking at the Citrus Belt League final. That time is #2 in CA history for wind-legal 100 meters. State Meet 200m champion Christian Shakir-Ricks, who was 3rd at State in the 100, ranks #2 here.